I came across this pic on Captain Willie Wines’ site, Iron Firemen.com. He gives a brief summation of his thoughts associated with this pic and they echo a lot of what I’m thinking. I’m slowly coming to the realization that a large percentage of the country’s fire services think that stuff we see in this photo and the video below are ok, “cool” or whatever. I just don’t get it <shaking my head>. It’s sad. People will get hurt and/or killed for absolutely no reason. It’s very sad. If you’re going to be a firefighter, be a professional one. This entry was posted in Professional and tagged Captain Willie Wines, Firefighter, Iron Firemen, IronFiremen.com, Professional Firefighter, Volunteer fire department, Willie Wines. 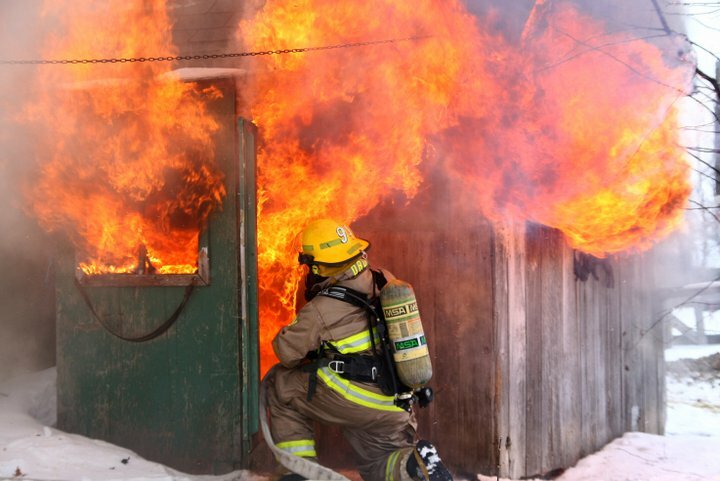 Okay I’ll be devil’s advocate here for a sec.. It’s a heavily involved garden shed and obviously there is no need for the pictured firefighter to be that close……however, is he in any danger ? Not really ! This is probably a guy who sees no fire, and I’m basing that on the sparkling clean gear and helmet that he’s wearing. So I’m assuming the close proximity to the fire is so he can get his gear salty, right ? I feel bad for the guy to be honest with you. I’ve been that guy, (before I got to move to an inner city firehouse)…….hoping to get a fire so i could get my gear dirty. Not really the same as the donkeys using gasoline on their live burn in the previous video. Hey Dave, thanks for commenting. I agree with you to a point. Do I really think the guy in the picture is really in any serious danger? Probably not. But I do think you hit the nail on the head with your summation that this is a guy who sees very little fire and wants to get his gear dirty for that crusty look. That kind of attitude is where I think the real problem and danger is. If he’s doing this in this relatively controlled and minor situation what will he do in a real fire situation? If he is already lacking experience is he going to fail to recognize signs of imminent flashover or backdraft or something as he’s crawling deeper into a situation to prove he’s a “real” fireman or to get his gear really crusty. I just don’t like it. Another issue I think about while looking at this picture is where are the officers or leaders of the department? Why are they allowing this to happen? That may say a lot about the mindset and caliber of the leadership. If they think that this is ok how good are their decision making processes and how committed to their firefighters safety are they? Finally, I was that guy too when I was first on. Bad thing happened too. I ruined a turn-out coat and received 2nd degree burns on my shoulders where the airpack straps compressed down. It wasn’t a good deal. And all because I was brand new and didn’t want to look it. Bad stuff can happen in pretty innocuous situations. Does the “DRD” on his turnout coat collar stand for: “Dead Right Dere” ? Thanks for reading Tiger. I do like the dere, and da dems, just talk to my brudder, he’d tell ya, lol.